Yesterday we completed the thirteenth moving day of our tour. Despite the number we have done there remains an element of stress to packing up and moving on. The stress level is obviously low compared to what I experienced at times during my full-time working life, but regardless it is enough to throw us slightly off balance. I have some work to do, so we spend much of the day around the Unicorn and head off in the late afternoon for a short walk. Lynnie and I visited the North York Moors a number of years ago and I recall doing a walk around Goathland, where we head today. Goathland is an isolated village on the North York Moors, but to be honest every village here is isolated. Lynnie and I don’t watch much TV so the references to Heartbeat are lost on us. Apparently the TV series was filmed here. In 1267 the village and much of the land around Goathland was given to the Duchy of Lancaster by Henry III, apparently the Duchy still owns a good proportion of the common land. Our route takes us out of the village and along a lane by the public car park. 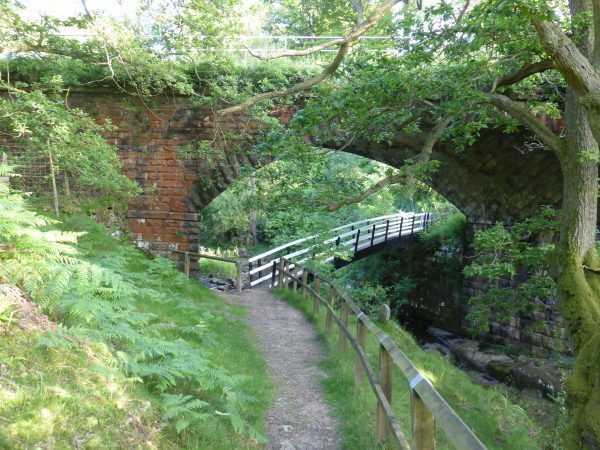 We soon take a footpath on the left signposted to Grosmont and follow it down past the old railway cottages and continue on past Incline Cottage, with its iron pump on the outside, eventually we reach a footbridge over Eller Beck. Here there is a plaque that tells us that we are now on the route of George Stephenson’s 1836 Whitby to Pickering horse drawn tramway railway. In 1845 it was improved to allow the use of steam locomotives and was in regular use until 1865. Now on the flat disused railway we make good speed. Those following the blog will know that wherever we go we seem to find a walk along a disused railway line. We are losing track (get the pun?) of how many we have walked, but think it is five or six. This one is particularly attractive as it follows alongside the Murk Esk. Today the river is running at a low level, but in 1930 it destroyed a bridge on this route, our old walking book tells us to take a diversion, which we do, but then find that a new footbridge has been built so the river crossing is now accessible to all. Steaming on (another pun) we start to here the sounds of the engines on the North York Moors Railway. As we get closer to Grosmont we walk alongside the siding where old steam and diesel engines and carriages await restoration. 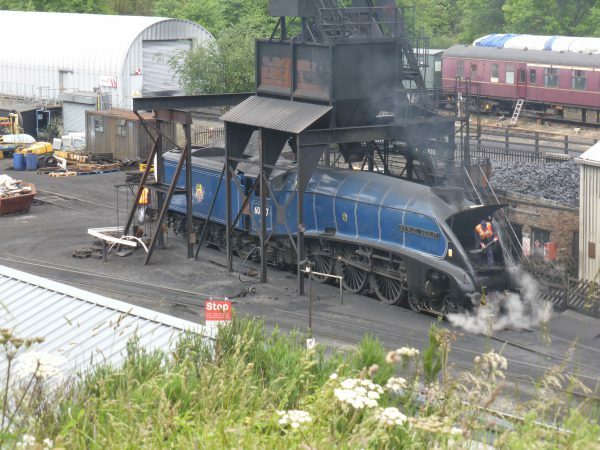 Up at the viewing point we get a cracking sight of the Sir Nigel Gresley taking on coal. The locomotive is named after one of Britain’s most famous steam locomotive engineers. Gresley (1876 – 1941) designed an extensive range of steam locomotives including the ‘Flying Scotsman’. 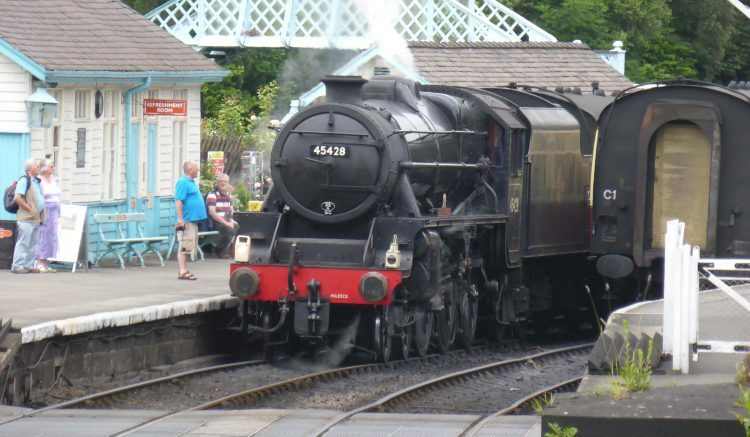 The North York Moors Railway is run as a charitable trust but operates a busy service between Whitby and Pickering it is a fantastic sight and as we walk down into Grosmont the level crossing on the road closes as a train pulls into the station. Before continuing our walk we visit the maintenance shed via the tunnel built by Stephenson for his horse drawn carriages. 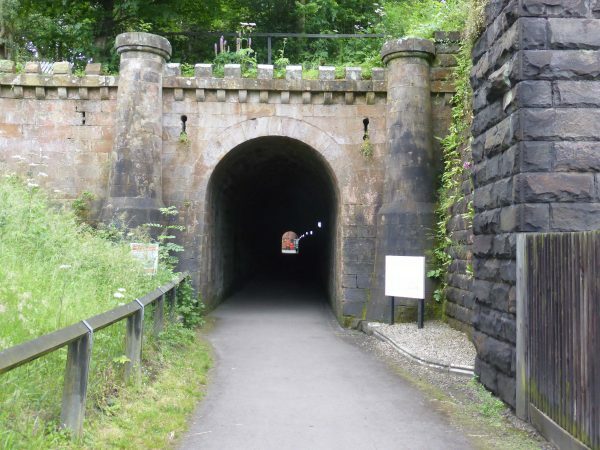 This is believed to be the world’s first railway tunnel and it was built between 1833 and 1835. The information board tells us that the tunnel is 130 yards long, 14 feet high and 10 feet wide, (they still work in imperial measurements up here). Frederick Swanwick, assistant engineer to George Stephenson, designed it. He was censured by the Director for wasting money on the castellated north entrance, it is stunning and thankfully has stood the test of time. The trains are still shunting around in the picturesque station, so another photo stop. 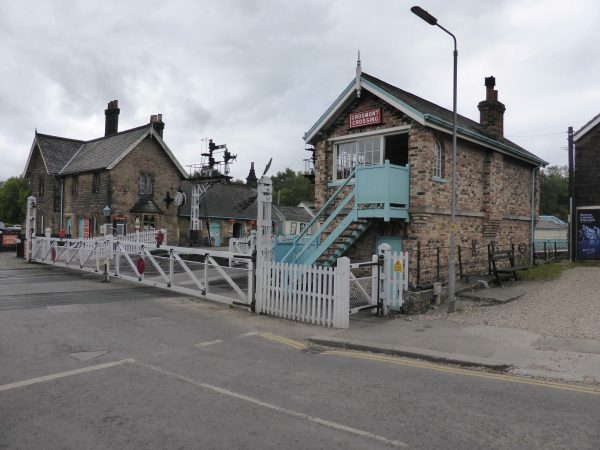 Grosmont is an attractive village and a mecca for railway enthusiasts. In the 19th century this was an industrial area with an iron works that was a significant employer, we see no obvious signs of this industrial history. 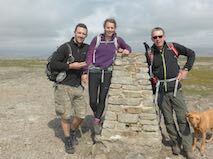 It is also on Alfred Wainwrights Coast to Coast path. This is the final stop before heading off to Robin Hood’s Bay (always assuming that you are taking the traditional west to east route). We leave the village by climbing the hill towards the east. We leave the pavement and take a footpath on the right opposite a house called Park Villa, it would have been a grand house in its heyday. The path takes us through Crag Cliff Wood, a glance at the drop on our right reveals how it obtained the name. It is a seriously steep drop masked by trees. On leaving the wood we follow the path to Green End Farm then turn up a track leading to the road. After a few hundred yards we turn left on the footpath and walk through the farm yard and cross a couple of fields to bring us out onto the road by Hollin Garth farmhouse. We ignore the wide track opposite to take a narrower footpath across moorland. We follow this to Hill Farm and then take a track on the right that leads to a cottage after which it turns into a path. Suddenly we are above Thompson Foss and carry straight on following the path that skirts the steep drop and leads us down to a footbridge under the railway bridge. We climb up the other side and follow the footpath across a field before joining a lane to take us back into Goathland. 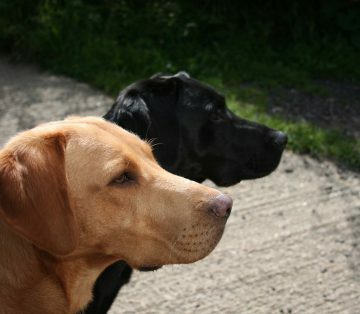 Our walk has been close to seven miles and a reminder of the attraction of the North York Moors. On arriving back at the Unicorn we hop out of the car, as Lynnie shuts her door she screams. She has managed to shut her thumb in the car door! It is obviously very painful. Cold packs applied and cups of tea help ease the discomfort, we discuss a trip to A&E but Lynnie insists that it is not broken.